Earlier this week, Hall H at this year’s San Diego Comic-Con played host to key cast and crew members from the upcoming eleventh series of Doctor Who. 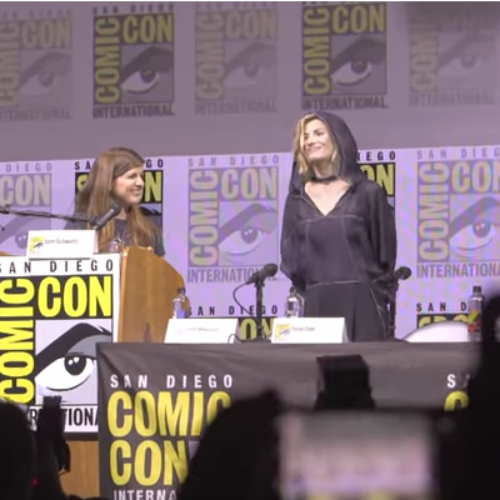 Moderated by IGN’s Terri Schwartz, the Doctor Who panel at SDCC 2018 was the first in the show’s history to introduce a new Doctor to fans before their first series had even aired – in this case, the first-ever female incarnation of the Time Lord, Jodie Whittaker. Joining Whittaker to take questions both from Schwartz and the assembled fans were two of the Doctor’s new friends, Tosin Cole (Ryan Sinclair) and Mandip Gill (Yasmin Khan), as well as showrunner Chris Chibnall and executive producer Matt Strevens. The panel was keen to stress that Jodie Whittaker’s Doctor is very much a continuation of the character that fans have come to know over the course of Doctor Who‘s 50+ year history. Designed by Doctor Who‘s new production designer Arwel Jones (Sherlock, Torchwood, The Sarah Jane Adventures), the latest iteration of the sonic screwdriver isn’t as sleek as its predecessors, featuring a more naturalistic look, unique curved handle and a new crystalline orange light running throughout. “There’s a very specific way that the Doctor comes by this sonic screwdriver. “This year is the perfect jumping on point for that person in your life who has never watched Doctor Who. I want you to go out there and recruit that person and go and sit them down for Jodie’s first episode. “You won’t see very much from the past. There’ll be little things here and there which [fans] are going to spot because we have a lot of love for the show and a lot of knowledge of the show. “I didn’t want to stand at the side giggling and clapping. I wanted to run about and jump about and do all those things. Those people didn’t really look like me! Doctor Who series 11 is set to air this autumn on BBC One and BBC America.